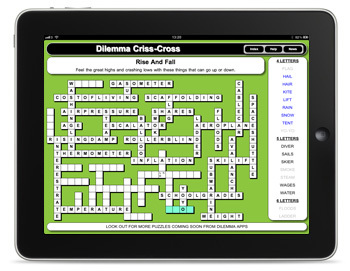 In Criss-Cross puzzles, all the chosen words have been fitted together in a unique way to create a grid, then the words are removed and grouped in order of their letter counts, with each group arranged alphabetically. It's up to you to put the words back into the grid in their original places - only one solution will work! You will find places in the grid where more than one word may fit initially, which means you'll have to note which letters cross with other words and think a few steps ahead. Puzzles are suitable for any age range and have been compiled on a wide range of themes, there is bound to be something in each of our packs for everybody. The initial App is free and contains 12 puzzles, additional packs of 40 puzzles can be purchased within the App and new packs of puzzles are released monthly.